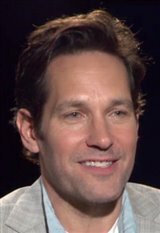 Raised in Kansas, Paul Stephen Rudd was born in New Jersey to an American father and a British mother. Always a go-getter, Rudd was Student Body President in high school. After graduation, he attended the University of Kansas, where he majored in theater. He then went on to study at the Academy of Dramatic Arts in Los Angeles and following graduation, decided to study in his mother's native land, where he participated in a three-month intensive workshop at the British Drama Academy at Oxford University. While there, he played Percy Bysshe Shelley in the Globe Theatre's production of Howard Brenton's Bloody Poetry. Back in the States, Paul's big break came when he landed a recurring role in the hit TV series Sisters in 1992. He played the role of Kirby Quimby Philby for two years, and managed to fit in several roles in TV movies at the same time, including The Fire Next Time (1993), starring Richard Farnsworth and Bonnie Bedelia. He made his major motion picture debut as Alicia Silverstone's brother Josh in the hit movie Clueless (1995). Later that same year, he appeared in another feature called Halloween: The Curse of Michael Myers. Despite a wide release, the movie was a bomb both critically and financially, and Paul's career faltered. His next role was that of Paris in Romeo + Juliet (1996), an updated version of Shakespeare's classic, starring Leonardo DiCaprio. Paul made two appearances on the TV version of Clueless in 1996, not re-creating the role he'd played in the movie, but playing a new character, Sonny. In The Object of My Affection (1998), he landed a co-starring role as a gay man with whom Jennifer Aniston falls in love. Paul played a supporting role in The Cider House Rules (2000), based on John Irving's novel. The film was a critical success as well as a hit at the box office and it was nominated for awards worldwide, including several Academy Awards. In 2002, he returned to the small screen when he landed a recurring guest role on the hit TV series Friends, playing Mike Hannigan, but didn't let his movie career slide. He's since been in numerous box office hits, including The 40-Year-Old Virgin (2005), Night at the Museum (2006), Forgetting Sarah Marshall (2008), I Love You, Man (2009) and the big-screen adaptation of The Perks of Being a Wallflower (2012). He starred in Prince Avalanche (2013). More recently, he starred in Anchorman 2: The Legend Continues (2014) and They Came Together (2014). In 2015, he starred in the title role of Marvel's Ant-Man , a hilarious take on the superhero. He also earned a star on the Hollywood Walk of Fame just prior to the film landing in theaters. Most recently, Paul reprised his role in the superhero sequels Captain America: Civil War (2016) and Ant-Man and The Wasp (2018), and lent his voice to the animated comedy Sausage Party (2016). On February 23, 2003, he married his girlfriend of five years, film publicist Julie Yaeger, who has since given birth to their son. They live in Manhattan.